THE Curtin Malaysia delegates joined over 1,000 delegates from over 80 countries at the USLS. 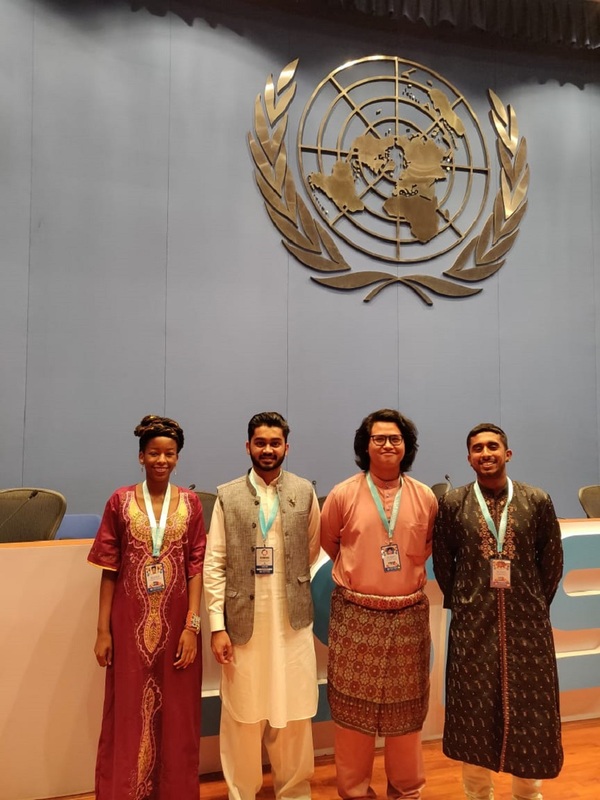 CURTIN Malaysia delegates (from left to right) Regina Mbeu, Saad Rasul Qureshi, Wan Ahmad Hakeemud–Deen and Sakti Satesh at the UN Conference Centre in Bangkok. MIRI: Four students of Curtin University Malaysia (Curtin Malaysia) described their participation in the recent 9th University Scholar Leadership Symposium (USLS) in Bangkok, Thailand as an experience of a lifetime. Chemical engineering student Regina Mbeu, mechanical engineering student Wan Ahmad Hakeemud–Deen Bin Wan Asmadi, electrical power engineering student SaadRasul Qureshi and marketing student Sakti Satesh joined delegates from over 80 countries at the symposium held at Bangkok’s United Nations Conference Centre. USLS is a week-long annual leadership development symposium and training programme organised by Humanitarian Affairs United Kingdom, a London-based social enterprise that initiates and supports humanitarian relief efforts and development programmes in countries that are poverty-stricken and disaster-prone. The symposium is aimed at providing youth leaders the opportunity to learn to become effective and distinctive leaders and effect positive change across the globe. Held annually in a developing country in the Asia Pacific region, more than 7,000 emerging young leaders from more than 100 countries have participated. Regina, who hails from Kenya, said she learned the importance of implementing the United Nations’ sustainable development goals in the face of rapid modernisation. She also appreciated the opportunity to interact with other young leaders from around the world. She said the opportunity to engage in panel discussions with representatives from agencies such as the UN Refugee Agency (UNHCR), UN Environment Programme (UNEP) and UN Entity for Gender Equality and the Empowerment of Women (UN Women) was also an eye-opener. The student delegates learned about the extensive work done by these agencies, particularly the unique opportunities they create for young people across the world. “We also heard from motivational speakers in various fields who talked about the importance of discipline, personal mastery and taking responsibility of one’s life. We learned the importance of having a vision and the power of working together to achieve common goals,” added Regina. Wan Ahmad from Malaysia commented that the USLS surpassed all his expectations. Being surrounded by over 1,000 other highly passionate delegates from across the world, all sharing the same ideals and goals for a better world, was a humbling experience for him. He was also impressed by the keynote speakers’ speeches on humanitarian issues, contemporary leadership and creating social change. They included Geraldine Cox, founder of Sunrise Cambodia, a sustainable community development organisation supporting at-risk children and communities in Cambodia’s, and David Begbie of the Crossroads Foundation, a Hong Kong-based charity which connects those with resources and those who need help. The USLS itinerary included a ‘Service Learning Day’ where delegates got to engage in meaningful community outreach projects within Bangkok. Wan Ahmad chose to join about 100 other delegates in a river cleaning activity clearing water hyacinths from the river using kayaks. They collected some 14 tons of hyacinths which were sent to a composting centre to be turned into fertiliser for local farms. Pakistani Saad said he was honoured to be chosen to represent Curtin Malaysia at the USLS. He, too, was touched by the accounts of the symposium speakers, many of whom had once been in positions of considerable authority or led luxurious lifestyles but dedicated their lives to engaging communities and impacting the lives of the less fortunate. Meanwhile, Sakti, who is from Malaysia, was impressed by how well the USLS was organised. Like the other Curtin Malaysia delegates, he found the speeches and parallel discussions most enlightening, and of all the speakers, he found Francis Kong, a prominent public speaker and business consultant from the Philippines, the most inspirational. “His impressive track record as a successful businessman notwithstanding, Mr Kong exuded considerable wisdom and confidence that really inspired me. He said confidence is not about creating a personal brand. More importantly, it should be about having a great sense of humour and forming great relationships, and I couldn’t agree more,” said Sakti. Since the inception of the first USLS in 2010, Humanitarian Affairs has partnered more than 500 of the world’s leading universities on the symposium. 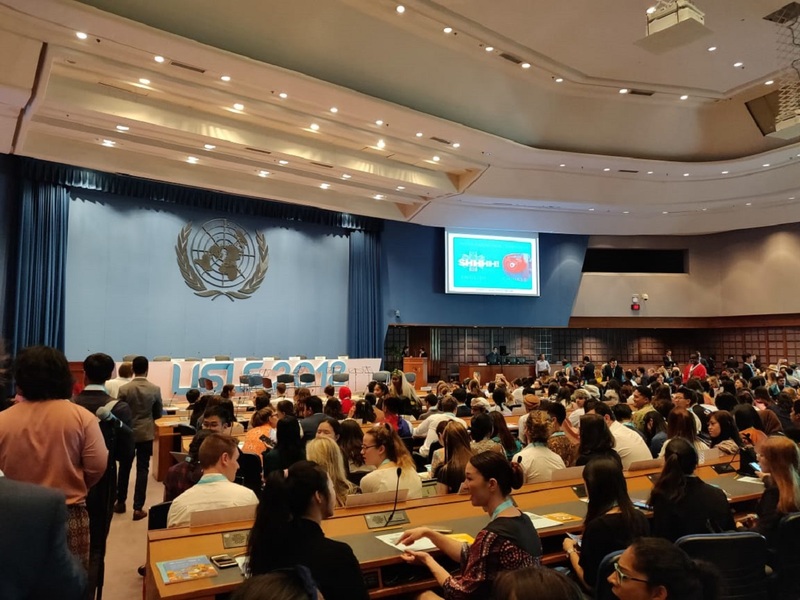 For many of these universities, sending delegates to the USLS has become an integral part of their student leadership programmes and spurred their students’ commitment to global mission. For Curtin Malaysia, this is the sixth year it has sent delegates to the USLS, making a total of 17 students so far. Their participation is funded by its Department of University Life under its student mobility programme focusing on student leadership, community engagement or social entrepreneurship development. USLS a lifetime experience for four 0 out of 5 based on 0 ratings. 0 user reviews.